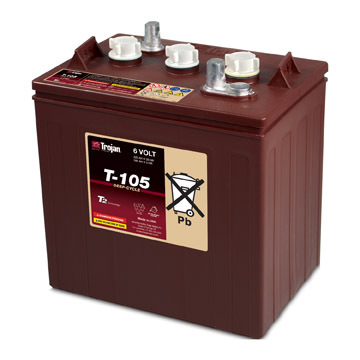 The Trojan T-105 has a long reputation as one of the best battery solutions for RV's, small off-grid and remote solar power applications. Put two of these batteries in series to get 12 volts and get ready to power your way into the future. The lendary T-105 is also available in a renewable energy variant, the T-105RE which is optimized for the unique demands of solar power. Built to deliver superior performance, durability and reliability, these batteries are Trojan's flagship line and can meet the challenges of the toughest application. These batteries are sold with no core charge!